to our school code 5735. Cary Chinese School proudly joins Harris Teeter’s Together in Education program to help raise funds for our school. It’s easy and it’s FREE. Simply give the cashier our code, 5735, and your VIC card when you check out and your card will be linked for the entire school year. That’s it! You only have to link your VIC card once each school year. Once your card is linked, our school will receive a percentage of your Harris Teeter brand (Harris Teeter, H.T. Traders, Harris Teeter Organics, HT Farmers Market and purchases in the HT Pharmacy) purchases credited back to our account. 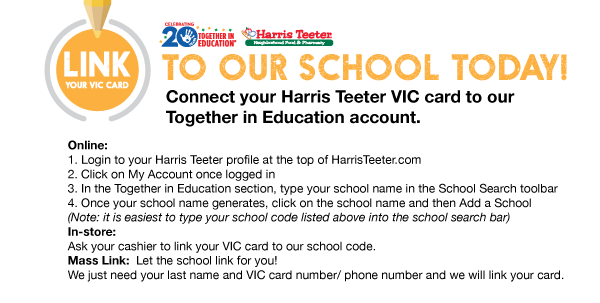 Don’t forget to link your VIC card to our account code 5735 next time you are shopping at Harris Teeter.